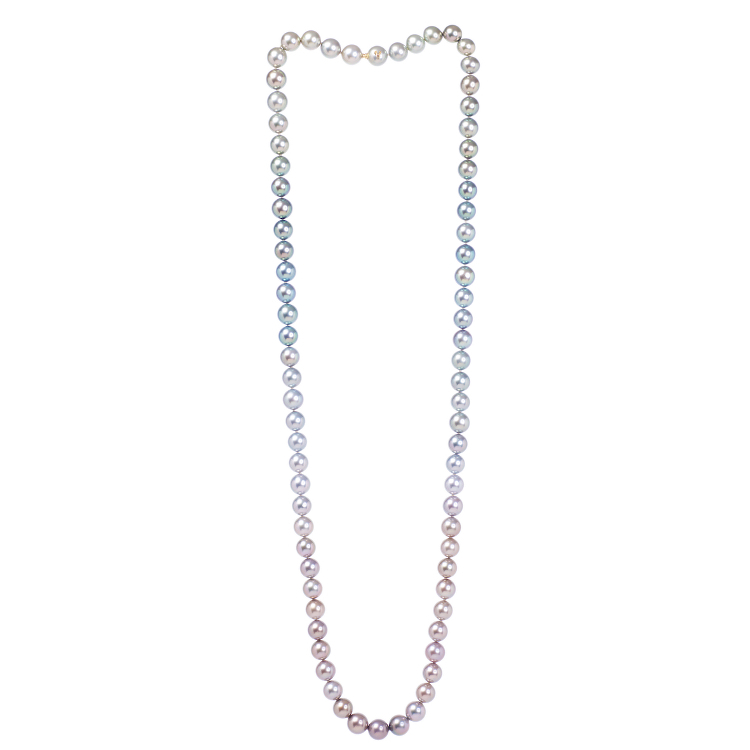 Hinerava's Signature Collection features a striking multicolored pastel Tahitian pearl necklace, composed of 77 pearls that flow perfectly from pistachio, aquamarine, lavender, and rose pearls. 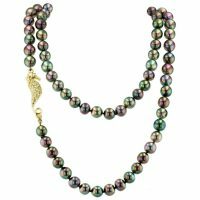 The sautoir length necklace is a testament to the beautiful natural colors of Tahitian pearls and its composition is a true work of art. 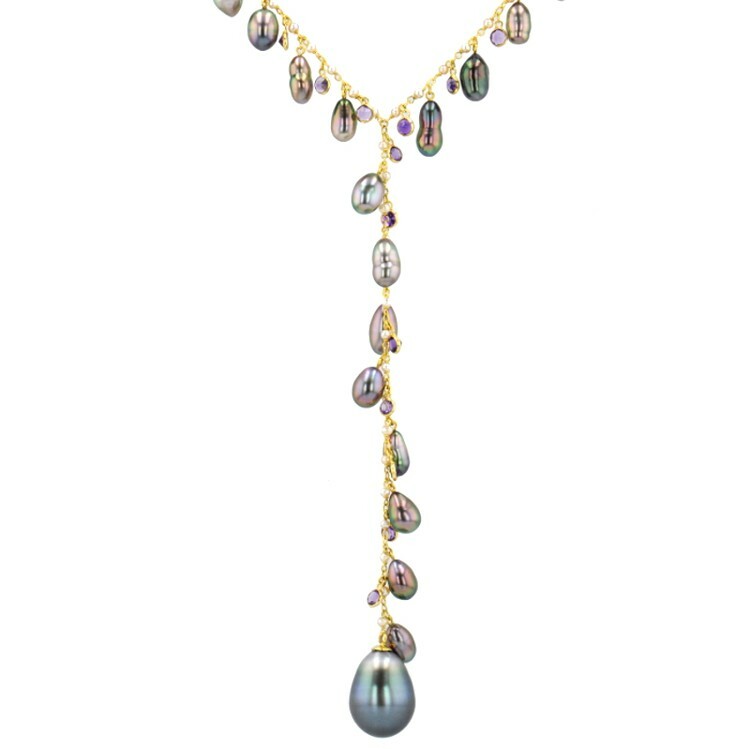 Hinerava's Tetiaroa Collection presents a unique Tahitian pearl sautoir with 79 peacock pearls, 10 to 11mm in size, A and B quality, adorned with an 18K yellow gold seahorse. The seahorse features 0.89 carats of sparkling white diamonds. 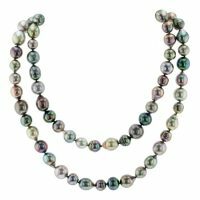 Hinerava’s Signature Silver Pearl Sautoir is a unique and exceptional Tahitian pearl necklace featuring 73 pearls, of 11mm. 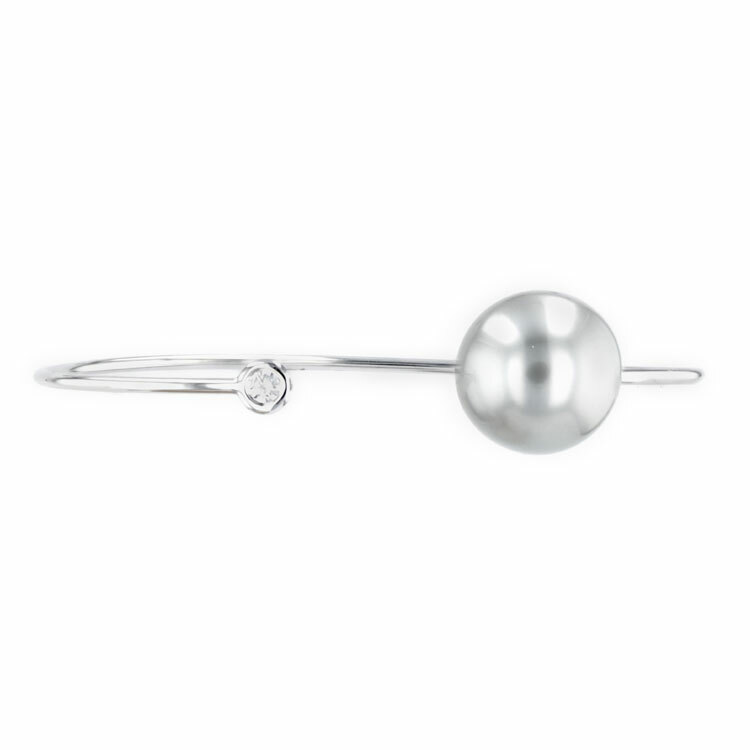 Each pearl is carefully selected to match perfectly. 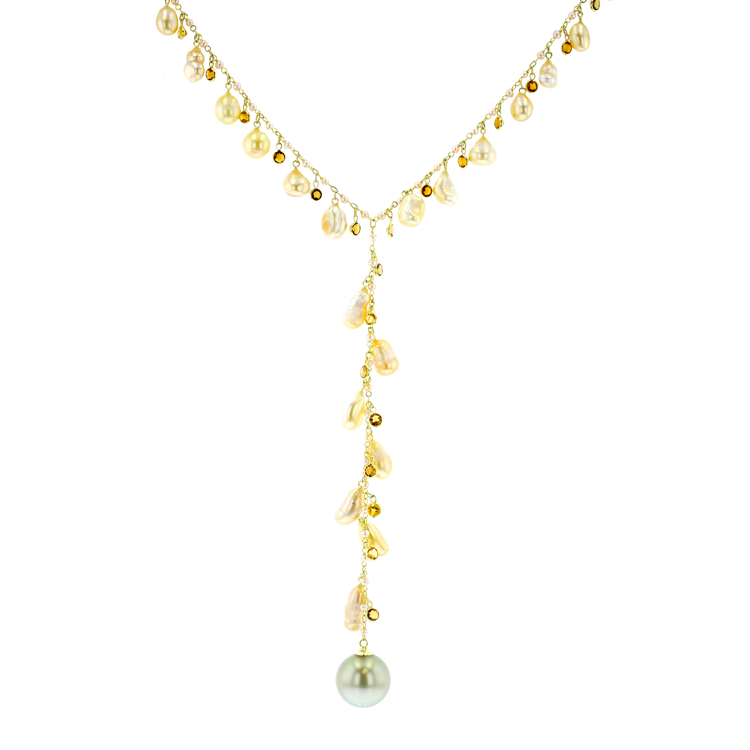 This necklace is an exquisite work of art and is finished with a diamond gold clasp, 0.15 carats set in 18K white gold. 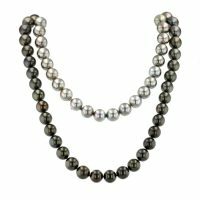 Hinerava’s Signature Collection features a striking dark dégradé Tahitian pearl necklace, composed of 77 pearls that flow perfectly from silver to black pearls. 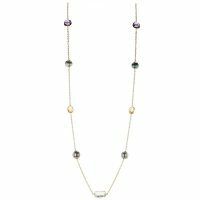 The sautoir length necklace is a testament to the beautiful natural colors of Tahitian pearls and is finished with a diamond gold clasp, 0.005 carats set in 18K white gold. Hinerava's Signature Collection features the harvest strand, a striking display of the various specimens of Tahitian pearls, including round, circled, baroque, and every shape in between. 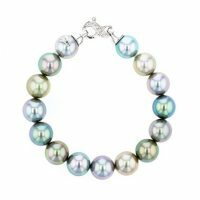 In addition, our harvest strand showcases the vibrant rainbow of colors in which Tahitian pearls occur. Pearls range from 9 to 14 mm size pearls. The sautoir measures 94 cm and is finished with an 18K gold clasp. Each harvest strand is a truly unique work of art. Hinerava's Privilège Collection features an exquisite Keshi Choker, composed of 157 exceptional multicolored Tahitian Keshis between 3 and 4mm, set in 18K white gold. Keshi weight is 10.4 grams. This is a one of a kind jewel. 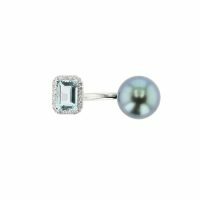 Hinerava’s Poésie Collection Tahitian pearl ring features a beautiful Tahitian pearl matched with an emerald cut aquamarine gem, 0.83 carats, and white diamonds, 0.14 carats. This in-between-the-finger style ring is set in 18K white gold. Hinerava’s Poésie Collection presents a blue gem composition: an aquamarine of 1.02 carats, a London blue topaz of 4.23 carats, surrounded with diamonds 0.31 carat, and an exquisite blue Tahitian pearl. The necklace is set in 18K white gold. Length: 42 cm with 2.5 cm extension chain. 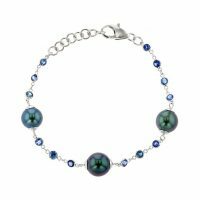 Hinerava's Poésie Collection presents an elegant bracelet made of 3 exceptional Tahitian Pearls and brillant cut blue sapphires, mounted in an 18K white gold chain. This quintessential Hinerava design is effortlessly chic. The bracelet measures 16 cm with 2,5 cm extension chain. 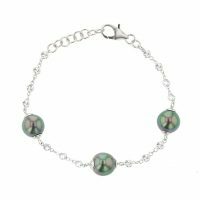 Hinerava's Privilège Collection features an exquisite Keshi Bracelet, composed of 94 exceptional multicolored Tahitian Keshi between 5 and 7 mm, set in 18K white gold. Keshi weight is 27.5 grams. This is a one of a kind jewel. Hinerava's Poésie Collection presents an elegant bracelet made of 3 exceptional Tahitian Pearls and brillant cut pink sapphires, mounted in an 18K white gold chain. This quintessential Hinerava design is effortlessly chic. The bracelet measures 16 cm with 2,5 cm extension chain. Hinerava’s Signature Pave Diamond Disk & Charm necklace features delicate white diamonds, 0.09 carats, set in 14k white gold with two exceptional Tahitian pearls Keshi. Hinerava's Poésie Collection presents an elegant bracelet made of 3 exceptional Tahitian Pearls and brillant cut white sapphires, mounted in an 18K white gold chain. This quintessential Hinerava design is effortlessly chic. The bracelet measures 16 cm with 2,5 cm extension chain. 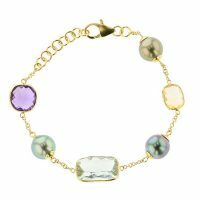 Hinerava's Poésie Collection features an exquisite bracelet made of 3 exceptional multicolored Tahitian Pearls interspersed between various cuts of green quartz, amethyst and citrine, mounted in 18K yellow gold. 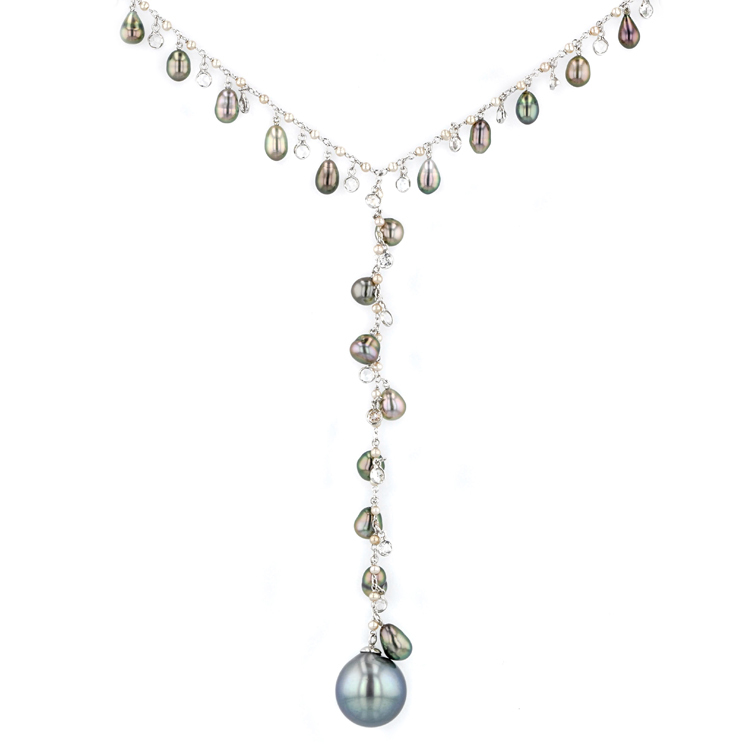 This quintessential Hinerava design showcases the spectrum of Tahitian pearl colors reflecting off of adjacent gems. The bracelet measures 16 cm with a 2,5 cm extension chain. 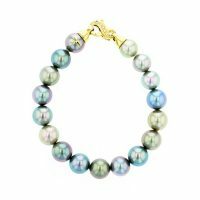 Hinerava's Poésie Collection presents an exquisite bracelet made of 3 exceptional Tahitian Pearls and brillant cut blue sapphires, mounted in three 18K white gold chains for a layered look. This quintessential Hinerava design is romantic and ever so elegant. The bracelet measures 16 cm with 2 cm extension chain. Hinerava's Poésie Collection presents an exquisite bracelet made of 3 exceptional Tahitian Pearls and brillant cut pink sapphires, mounted in three 18K white gold chains for a layered look. This quintessential Hinerava design is romantic and ever so elegant. The bracelet measures 16 cm with 2 cm extension chain. Hinerava’s Signature Double Chain Diamond Charm & Diamon Bezel necklace features three delicate white diamonds, 0.09 carats, centering an exceptional Tahitian pearl of 9 mm set in 14k yellow gold. Hinerava's Poésie Collection presents an exquisite bracelet made of 3 exceptional Tahitian Pearls and brillant cut white sapphires, mounted in three 18K white gold chains for a layered look. This quintessential Hinerava design is romantic and ever so elegant. The bracelet measures 16 cm with 2 cm extension chain. 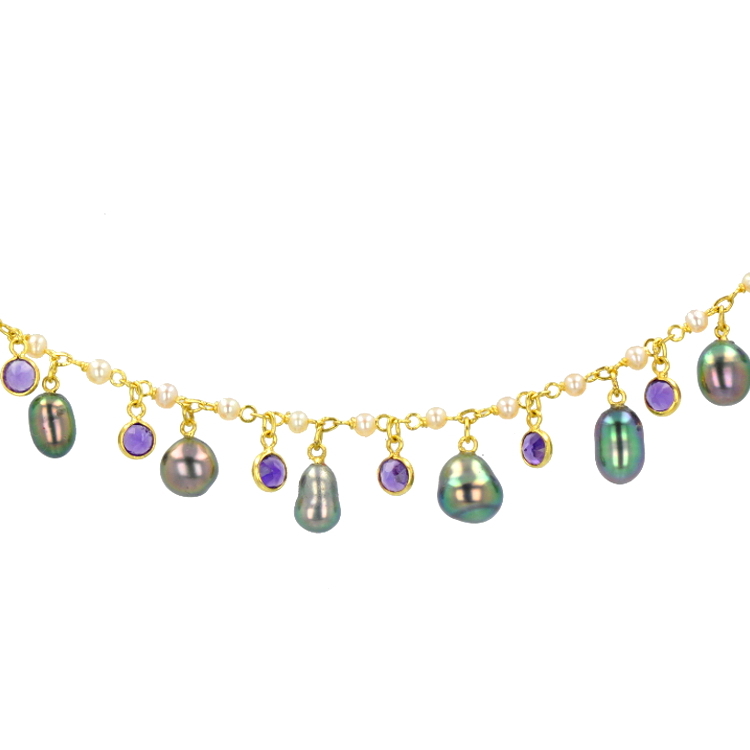 Hinerava's Poésie Collection features an exquisite necklace made of 6 exceptional multicolored Tahitian Pearls interspersed between various cuts of green quartz, amethyst and citrine, mounted in 18K yellow gold. This quintessential Hinerava design showcases the spectrum of Tahitian pearl colors reflecting off of adjacent gems. The necklace measures 93 cm. Hinerava’s Poésie Collection presents an exquisite 4.1 carat white topaz gemstone lariat set in 18K white gold with 27 beautiful Tahitian pearls. Length: 26 cm. 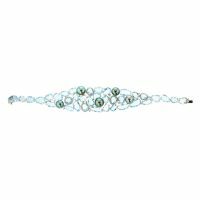 Hinerava's Privilège Collection features a one of a kind bracelet composed of 35 exceptional emerald and blue Tahitian pearls, adorned with brilliant diamonds, 1.03 carats, set in 18K white gold. Hinerava’s Poésie Collection presents an exquisite bracelet made of exceptional white South Sea keshis and brilliant cut white topaz, mounted in 18K white gold. This quintessential Hinerava design is romantic and ever so elegant. Hinerava’s Poésie Collection presents an exquisite bracelet made of exceptional Tahitian keshis and brilliant cut amethyst, mounted in 18K yellow gold. This quintessential Hinerava design is romantic and ever so elegant. Hinerava’s Poésie Collection presents an exquisite bracelet made of exceptional golden South Sea keshis and brilliant cut citrine, mounted in 18K yellow gold. This quintessential Hinerava design is romantic and ever so elegant. Hinerava’s Privilège Collection features a one of a kind Aquamarine & Diamond Pearl Bracelet composed of 5 exceptional blue Tahitian pearls, adorned with 36 slices of rare aquamarine, 40.36 carats, and 113 brilliant diamonds, 0.53 carats, set in 16.54 grams of 14K white gold. 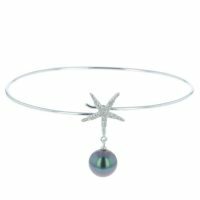 Length: 7"
Hinerava’s Signature Collection features a delicate starfish bangle bezeled with diamonds 0.15 carats, a single Tahitian pearl, set in 14K white gold. 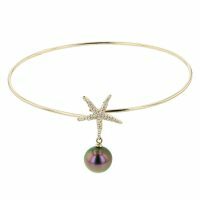 Hinerava’s Signature Collection features a delicate starfish bangle bezeled with diamonds 0.15 carats, a single Tahitian pearl, set in 14K yellow gold. Hinerava’s Signature Bezel Diamond Solitaire & Pearl bracelet features a striking bezel white diamond, 0.07 carats, set in 14k white gold balanced with an exceptional Tahitian pearl of 13 mm. 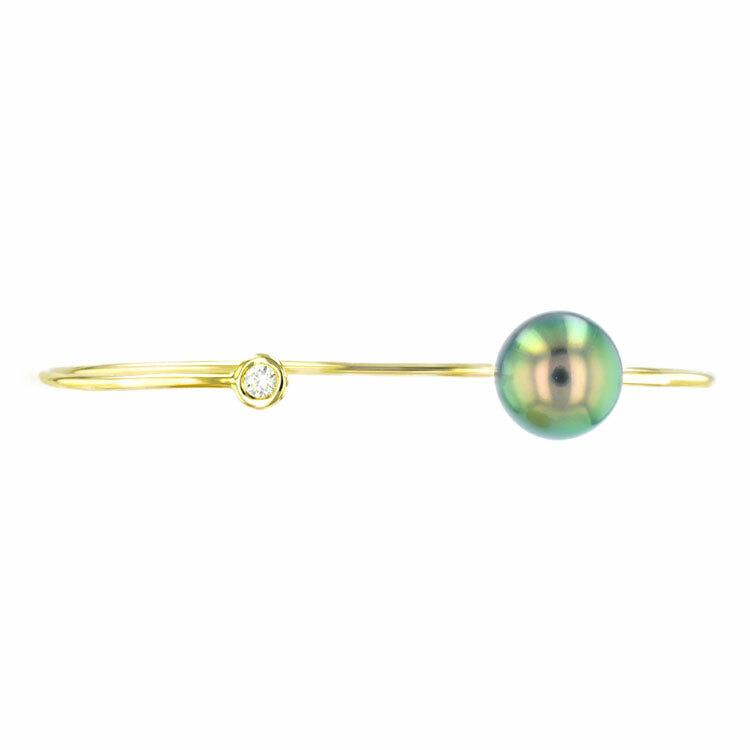 Hinerava’s Signature Bezel Diamond Solitaire & Pearl bracelet features a striking bezel white diamond, 0.07 carats, set in 14k yellow gold balanced with an exceptional Tahitian pearl of 13 mm. Hinerava's Signature Collection features a white diamond spiral cuff, 0.19 carats, set in 14K gold and adorned with two beautiful contrasting Tahitian pearls.This cuff is available in yellow and white gold. 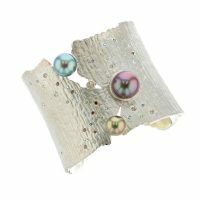 Hinerava’s Privilège Collection features a one of a kind Pearl Sunset cuff, born from a collaboration with LJD Jewelry. The cuff features 3 exceptional multicolored Tahitian pearls, white diamonds 0.49 carats, aquamarine 0.09 carats, and garnet 0.26 carats, set in a tarnish resistant 925 silver. 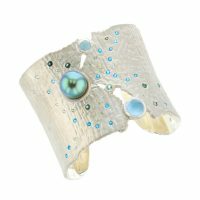 Hinerava’s Privilège Collection features a one of a kind Torn Between cuff, born from a collaboration with LJD Jewelry. 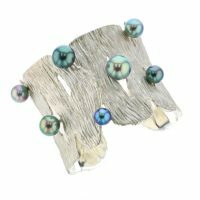 The cuff features an exceptional blue Tahitian pearl, tourmaline 0.6 carats, sapphire 0.57 carats, aquamarine 3.47 carats, and apatite 0.78 carats, set in tarnish resistant 925 silver. Hinerava’s Privilège Collection features a one of a kind Seagrass cuff, born from a collaboration with LJD Jewelry. The Seagrass cuff features 7 exceptional blue and emerald Tahitian pearls, set in tarnish resistant 925 silver. 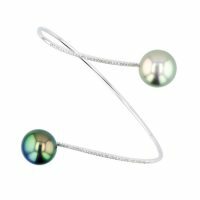 Hinerava's Privilège Collection presents a geometric bracelet set in 18K white gold with light blue topaz and exquisite Tahitian pearls, ranging from light rose, deep rose, lavender, and aubergine. This statement bracelet is a one of kind jewel. Lenght: 6,5cm - 8cm. 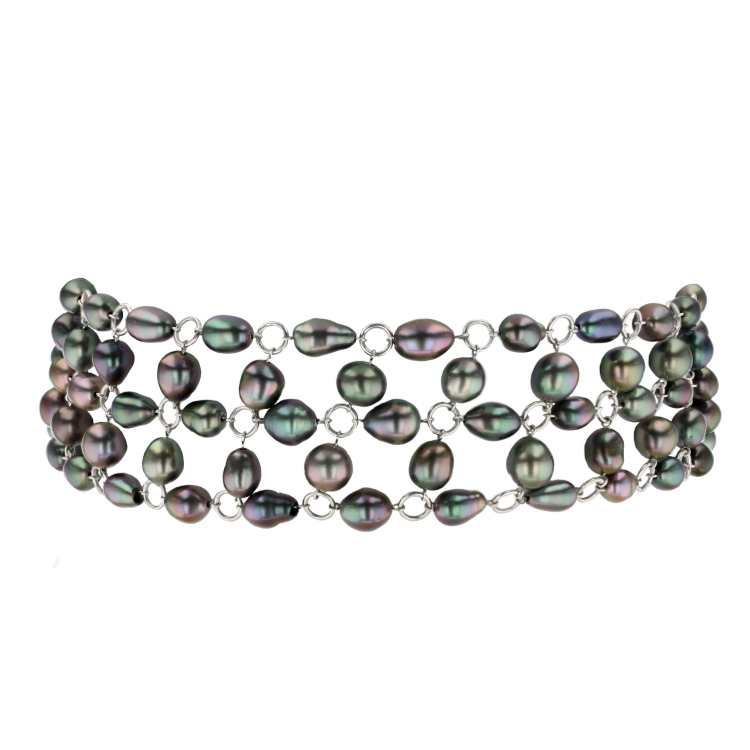 Hinerava’s Signature Multicolor bracelet features 16 pearls of 10 mm in size. Each pearl is carefully selected for color, size, and shape, and arranged in a multicolor composition. This bracelet is an exquisite work of art and is finished with a diamond gold clasp, 0.114 carats set in 18K gold. White or Yellow gold clasp available. 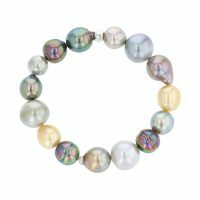 Our Signature Collection features this vibrant harvest pearl bracelet composed of a striking display of the various specimens of Tahitian pearls, including round, circled, baroque, and every shape in between, mounted on a stretch elastic for ease and comfort. 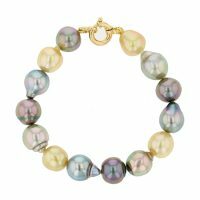 Hinerava’s Signature multicolor pearl bracelet features 13 to 14 pearls of 11 mm in size. Each pearl is carefully selected for color, size, and shape, and arranged in a multicolor composition. This bracelet is finished with an 18K gold clasp. White or Yellow gold clasp available. 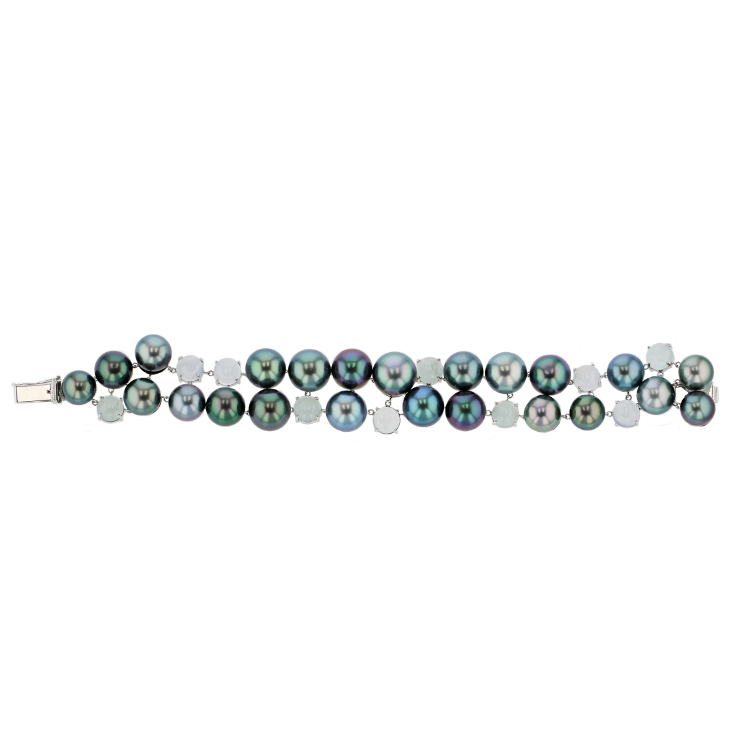 Hinerava’s Signature Multicolor bracelet features 17 pearls of 9 mm in size. Each pearl is carefully selected for color, size, and shape, and arranged in a multicolor composition. This bracelet is an exquisite work of art and is finished with a diamond gold clasp, 0.114 carats set in 18K gold. White or Yellow gold clasp available.